Chapter 1: "The Super-Menace of Metropolis"
Our story begins with a disturbing splash page of our hero dislodging an entire skyscraper and hurtling upward with it laughing mockingly, while its inhabitants peer out of their windows and question the Man of Steel's sanity. As the story begins, we see Superman answering an SOS from an ocean liner about to strike an iceberg. He makes an unorthodox rescue by ripping the Transatlantic cable from the ocean's bottom and using it to tow the liner in to port. The ship's captain is grateful, but puzzled by Superman's method, observing that the Man of Tomorrow has callously disregarded the fact that it will cost millions to repair the cable. In the following days, we see this pattern repeated - Superman diverts a meteor from a town, but it crashes into a dam, causing massive floods. He rescues some castaways from a giant sea creature, but leaves them marooned on an island. His behavior becomes increasingly more bizarre, as he seemingly adopts this sea-creature as a pet and takes him through Metropolis, leaving behind a trail of destruction. The officials of Metropolis are becoming concerned. Although there has been no injury or loss of life from these incidents, they are nonetheless alarmed by Superman's behavior. They call upon an expert named Dr. Peabody, and it is his opinion that the Man of Steel has lost his marbles and must be subdued immediately! They call out for a world-wide kryptonite search, as they know that is the only way he can be captured. Back at the Daily Planet, Lois is convinced that Superman can't be behaving this way, and that it must be one of his robots malfunctioning, while he's away on a mission. She sets out to prove her theory, and with the help of Jimmy's signal-watch, lures the Man (or robot?) of Steel to a lab, where he is bombarded by "100 billion volts of man-made lightning", enough to short out any electronic device. But alas, Superman shrugs off the fireworks, and mocks Lois, "Did you think I was a robot? Now you know the truth! I'm real!" Our hero then flies to a mountaintop, and yells "My plan is working ... I'll keep on smashing, destroying, until I've achieved my goal!" He then creates even more havoc - using his super-breath to blow hurricane winds through a tunnel, creating a massive car pile-up - yanking a subway off the tracks and swinging it wildly through the air. Again, there are no fatalities, but the world is left wondering what Superman will do next. Has the Man of Steel gone off the deep end? We'll find out in Chapter 2! Chapter 2: "The Revenge Against Jor-El"
As we begin Chapter 2, Superman continues running amok - now filling in the Grand Canyon with gigantic boulders (!!). But at last, an explanation comes for his bizarre behavior - this Superman is an imposter! As we read on, we find that the real Superman has been observing what's been happening from Kandor via an "ultra-scanning screen". He then recalls the events leading up to his current predicament. A week before, Superman visited his Fortress to make a routine check of the bottle city, and during his inspection of the air hoses, was surprised to pick up via super-hearing a voice screaming to him for help from within Kandor itself! As the Man of Steel trained his microscopic vision on the stranger, he revealed himself to be a scientist named Kull-Ex. Keeping Superman distracted with his story, Kull-Ex then trained his "exchange ray" on the Man of Steel, and the two instantly traded places! In fact - their costumes were exchanged also, as Kull-Ex gloated to Superman, who now watched via the screen in dismay as he realized his super-powers are gone under the influence of the Kryptonian city's gravity. Kull-Ex then completes his impersonation by molding a life-like Superman mask in the Fortress "chem-lab", and takes off on his mission of destroying the Man of Steel's reputation. Now the big question puzzling Superman - why does Mr. Ex have it in for him? Thanks to a pre-recorded tape left by the Kandorian scientist, Superman hears of the origin of Mr. Ex's vendetta against the El clan. Back on Krypton, years before Kandor's abduction by Brainiac, Kull-Ex's dad, Zell-Ex, was working on an invention that would revolutionize transportation - an all-purpose vehicle capable of land, sea, air, or underground travel. But before he could finish the project, fate intervened - an artificial wind generated by one of Krypton's weather-control devices blew his blueprints out into the streets! Some time later, Zell-Ex finished the invention, but as he entered the patent office, much to his dismay he finds that another scientist named Jor-El beat him to the punch. Zell-Ex is convinced that Jor-El quickly put together his model after finding the wind-blown blueprints and accuses Jor-El of thievery, but Jor-El insists he came up with it on his own. To compound the injustice in Zell-Ex's eyes, the product is mass-produced and became so commonly used on Krypton, it became known simply as "the Jor-El", just as the Ford car on earth was named after its inventor! Zell-Ex swore revenge on his nemesis, but was never able to carry it out. Brainiac shrank Kandor and its inhabitants, and Jor-El perished when Krypton exploded. But then, by a strange twist of fate, it is none other than Jor-El's son that rescues the bottled city and brings it back to his Fortress. Shortly thereafter, Zell-Ex, on his death-bed, solemnly commissions his son to carry out his revenge against the hated El survivor. Superman, having now been filled on Kull-Ex's motive, is convinced that his father is innocent, but is baffled as to how to prove it. He finds a "Jor-El" vehicle conveniently handy and attempts to dig through the bottom of the bottle to escape, but finds that Brainiac's glass is impervious to the drill. He next attempts to use the vehicle to fly through the air tube that pumps in the city's air supply, but is blown backwards as the inward flow is too powerful. Dejected, Superman returns to Kull-Ex's apartment and observes to his horror that angry mobs have broken into the Superman museum and are in the process of bringing down his statue! The Man of Steel has now become so villified that, at his approach, mothers carry their children inside to hide in storm cellars! And, perhaps the final blow, even Lois, Jimmy, and Perry at the Daily Planet are convinced that Superman is evil and must be avoided. At an isolated mountaintop, Kull-Ex brags of his victory, and as Superman helplessly watches from Kandor, he now realizes his reputation has been shattered, and he'll now be remembered as history's blackest villain. And even if the Man of Steel could somehow escape, how could he avoid a world-wrecking battle with his super-powered opponent? How will Superman get out of this one? Stay tuned for the final chapter! Chapter 3: "The Duel of the Supermen"
As Chapter 3 begins, Superman glumly sits in Kull-Ex's lab on Kandor, watching on the screen a group of workers boarding up the Superman Museum in Metropolis with big signs reading "Closed Permanently"! But meanwhile, a new player emerges on the scene... in Midvale, orphan Linda Lee listens in disbelief to the radio bulletins from Metropolis, and decides to take matters into her own hands ... "I'll change to my Supergirl costume and find out the truth!" Using her telescopic vision, the Maid of Steel tracks the faux Superman to Egypt, where he's in the process of stacking the pyramids and the Sphinx like toy blocks. She urges him to come to his senses, but Kull-Ex is caught off-guard by this super-powered female upstart. Apparently, Supergirl was a secret even to Kandor during this phase of her career, as Mr. Ex mistakes her for a fellow Kandorian escapee. Supergirl immediately realizes that this fellow is an imposter. After a brief recap of her true origin (presumably to accomodate the reader, this being her first appearance in the Superman title), Kull-Ex, underestimating the super-powered teen, in turn fills her in as to his true origin. Supergirl immediately takes off for the Fortress to rescue her cousin, but Kull-Ex taunts her "Go ahead, silly girl! You'll find out it won't do you any good!" Having been previously filled in by Superman as to its location, Supergirl quickly gains entry to the Fortress and attempts to pluck the Man of Steel out of Kandor with a pair of tweezers(!!) (Rather humorous when you think of how routine going in and out of the bottle became later). With the aid of her microscopic vision, she pinpoints him and gently picks him up, remembering that he is no longer invulnerable. Once outside the bottle, Superman regains his powers, but being the size of a gnat realizes he is still at a huge disadvantage. However, he hits upon a plan and whispers it to his cousin. Supergirl leaves the Fortress to carry out her part, while Superman remains behind, sure that Kull-Ex will soon come to gloat over him. Sure enough, the super-imposter arrives, and mocks the "super-bug", pointing out that the exchange ray won't work without the element "Zenium", which doesn't exist on earth. Superman is swatted away by Kull-Ex, but spying that Supergirl is about to put his plan into action he begins distracting his foe by momentarily weakening him with kryptonite stored in a lead box for experiments. Kull quickly turns the tables by trapping the Man of Steel inside the lead box, and Superman realizes his life is now in the hands of his young cousin. Suddenly the observation dome of the Fortress slowly begins to open. Kull-Ex is stunned to see the Earth receding in the sky above him! While he was distracted, Supergirl, with an assist from Krypto, dug out the whole blamed Fortress of Solitude and flew it out into space! The object of this super-excavation soon becomes evident as Superman weakly observes to Kull-Ex that they've overtaken light-rays from Krypton, and he can now observe what really happened before its destruction. Kull-Ex observes to his astonishment that while most of his father's blueprints did get blown out the window, the most important page unknowingly wound up in his young hands, which he proceeded to then doodle on and later feed to an animal at the zoo! Jor-El having been exonerated, Kull-Ex immediately revives Superman and vows to set things right upon their return to Earth. He also spots some Zenium in a passing meteor, and grabs it to power the exchange ray back in Kandor. Story - 4: A fabulously wacky story, even by editor Mort Weisinger's standards, but one of those hidden stepping-stones of the Silver Age. The Fortress and Kandor are both given a prominent role. Supergirl, just 8 months removed from her debut, gets her first guest appearance in the flagship title. Superman gets some new insight as to his father's past in another flashback to Krypton. Even Krypto, who had just a couple of previous appearances as an "adult", gets in on the action here. And I believe this may be the one and only time someone was extricated from Kandor by a pair of tweezers! 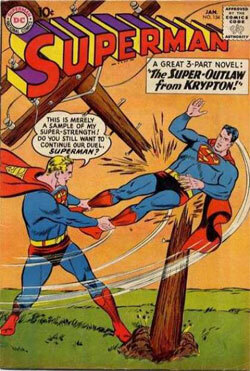 This tale was also probably the last time that Superman's powers were attributed solely to the lesser gravity of earth. I suspect that even the kids writing in to Mort at the time would be skeptical that gravity alone could cause the Man of Steel to be totally powerless in Kandor. Two months later, in Action Comics #262 (March 1960), a story called "When Superman Lost His Powers" had Clark and his pals transported to another world where the Man of Steel was powerless - but now it is implied that this power loss is due to the planet having a red sun, like Krypton, adding yet one more element to the mythos! Another milestone in this tale is the name "Kandor" is finally and firmly established. Although the name was dropped once in the bottled city's debut in Action Comics #242, in subsequent appearances it was referred to generically as "Krypton city", or "the city from Krypton". In fact, in World's Finest #100, "the Dictator of Krypton City" (March 1959), its citizens are even referred to by Luthor as "Kryptonites"!?! Art - 4: At the time of this story, Wayne Boring , along with Al Plastino, were still the predominant Superman artists. Boring was superb in depicting the Man of Steel in a tragic light. As Superman broods in Kandor, he truly looks like the weight of the world is upon him. Cover Art - 3: The cover by Curt Swan and Stan Kaye is very good, although it doesn't quite capture the frenetic action in this story.